Camping is one of those activities that let you enjoy the true essence of nature. Birds chirping in the trees, beautiful sunsets, and a breath of fresh air. It can be a great time to reconnect as a family or even reconcile with yourself. But it is important that you always have the right gear for the trips. Because just as nature is beautiful, it can be hostile too. One piece of equipment that can really come in handy but is often overlooked is a tent heater, Which is understandable because most camping is done during the summer when cold is not an issue. But even then depending on where you are some nights can be cold and demand that you have a heater. And it is at times like this you really wish you had a tent heater. Especially so if you have children. And hey, how is this for a tip, Winter is also a great time to go camping. At least then you don’t have to worry about the campsites being overcrowded. 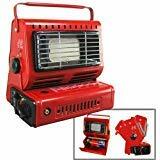 And now for winter camping, you are definitely going to need a tent heater. Having said that I will now be taking you through some of the best heaters you can buy right now and hopefully, I can make your next camping trip or hunting expedition more fun and less torturous. It would be unfair to talk about heaters without mentioning Mr. Heater considering they are the uncrowned kings of this niche. I cannot think of a single heating need for which they do not have a solution. 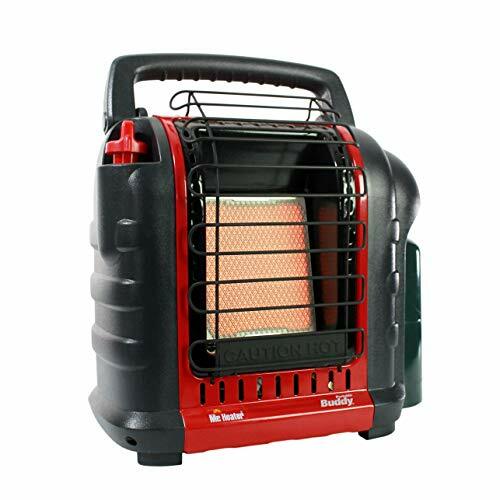 In our case, there is no better heater I would recommend for heating your tent than their F232000. One good thing about this heater is that it is as good for outdoor heating as it is for indoor with the ability to cover up to 225 square feet of space. Depending on how cold it is, this heater will let you choose between either the low heat setting of 4000BTU or the high heat setting of 9000 BTU. The manufacturers have also placed various safety measures in place one of which is auto shutdown in case the heater is tipped over. The heater will go off if the pilot light goes off or if it detects low oxygen level in your tent. The MH9BX comes with a fold down handle to enhance portability while also saving up on storage space. It also has a swivel regulator to enable you to connect it to a remote gas source in case you need to supplement its standard gas supply. The connecting hose and filters are not provided though. On the downside, the F232000 will have operation issues in heights above 7,000 feet. If you are just looking to heat up a small tent of about 3 people or less and you are also operating on a budget, then go no further than this butane heater by Tooluze. It uses the standard butane gas cylinders which apart from their affordability are easily portable. However, there is a downside to this. One tank can only run for 2-4 hours which means you will have to wake up during intervals at night to change the tanks. The manufacturers are pretty clear on the use of these heaters and advise that you only use them for outdoor or well-ventilated areas only. Therefore, ensure that when using it to heat your tent, you leave room for aeration. The Tooluze camping heater features a ceramic burner that can be swiveled in order to supply the heat at specific angles. As a safety precaution, the heater is equipped with a pressure sensing shut off device that will turn off the heater immediately the flame goes off. Finally, buying this heater will afford you a one-year-warranty from the manufacturer. 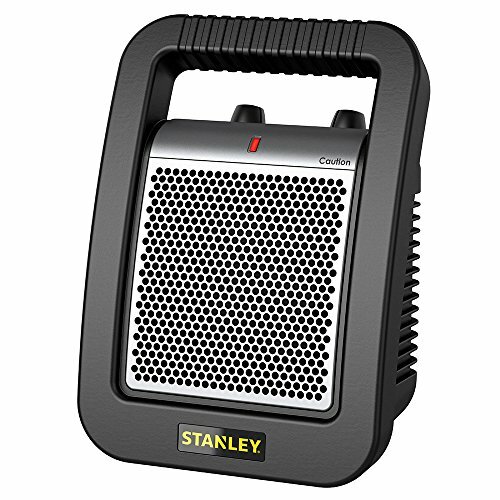 Electric heaters may not be very convenient when camping in the woods but if its an open space camping where you have access to your car or the campsite’s power supply then they will be excellent choices. And among the top reasons for this is that unlike the fuel burning heaters, electric heaters do not produce carbon monoxide or carbon dioxide. One electric tent heater that I will recommend is the Lasko 675945 heater. Measuring a mere 12” this heater will meet your heating needs without taking much of your space or posing portability issues. It’s even equipped with an easy grip handle to facilitate movement around the tent. The Lasko heater is rated 1500W and comes with 3 heating modes. That is the low, high and fan-only mode. It is equipped with an adjustable thermostat that will enable you to regulate the temperatures to the most comfortable level for you. The heater is made from ceramic components that would be effective in regulating the temperatures without the need for other mechanisms. However, the manufacturers have taken the extra step of including an automatic overheating protection mechanism so that is one problem you don’t have to worry about. Finally, the Blue plug technology is an added precaution by Lasko that will instantly cut the power to the fan in case of any power fault. With electricity, you can never be too careful. For the longest time, I had been skeptical about AmazonBasics. And you would too if you came across their name for every product you searched for. But it all changed when I tried one of their speakers. Now I can vouch for them and assure you that their products are always top notch. Especially considering their price point. 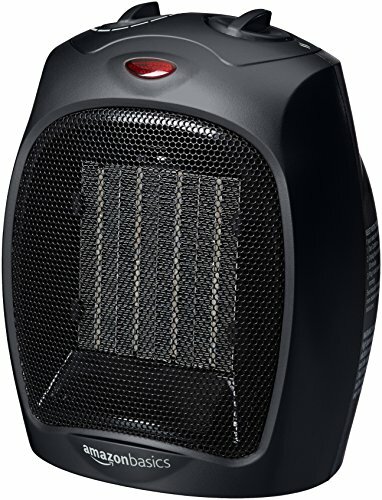 I mean, just compare the price for the AmazonBasics space heater with other heaters packing same features and you will understand what I am saying. 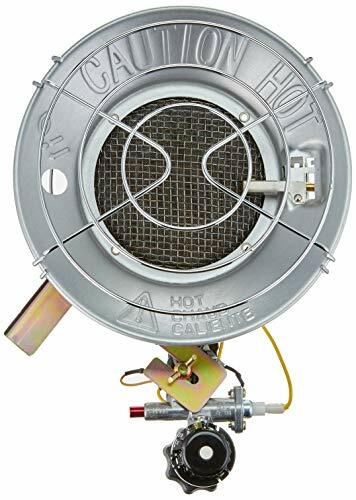 This specific heater is advertised as a home or office heater but the features that make it excellent for that purpose are also what makes it the best fit for tent heating. It has a 1500W rating and comes with 3 output options which are low, high and fan only. For safety reasons, the heater will automatically shut down if it overheats or tips over. The inclusion of a power indicator light is a handy feature that lets you know when the power is connected. As is expected with any electric appliance you are advised not to operate in wet areas. Hence, when camping, don’t leave it directly on the ground as it may come into contact with water. Trust me you do not want that happening. The heater is available in black and grey. The Dyna-Glo TT15CDGP heater is another impressive option for tent heating. One of its highlight features is the impressive heat output which ranges from 9000BTU as the lowest heat setting to 15000 as the highest heat setting. In between is a medium setting of 13000BTU. This is significantly higher than Mr. Heat’s whose highest heat setting is 9000BTU. The Dyna-Glo heater has a coverage area of 15 radius and can withstand extreme winds thanks to the use of double-layered mesh wire in the manufacture. Right off the box, the heater has already been assembled and all you have to do is attach the POL connector to the propane tank. Even better the POL is equipped with a hand wheel to make the connecting process effortless. Safety is also not something that the Dyna-Glo manufacturers take lightly and they have included a tip switch that will cut off the gas supply shutting down the heater in case it tips over. This heater has also been tested and approved for safety by the Canadian Standards Association (CSA).